On the evening of July 8, 1913, "Patience Worth," who claimed to be the spirit of a seventeenth-century Englishwoman, became a spirit control for Pearl Leonore Curran, a young woman in St. Louis, Missouri. Curran was not a practicing medium, nor did she have any interest in Spiritualism, yet during a period of three years, Patience Worth dictated through the process of automatic writing a stream of proverbs, lyric poetry, and plays, and a number of intricately constructed novels. Curran's formal education had ended with the eighth grade. She seldom read, had never traveled, and was completely unfamiliar with literary people or people of a scholarly bent. At no time in her life had she ever given any indication of a latent creative gift. Yet, of one of the spirit-dictated novels, a reviewer for the New York Times wrote that the plot was fashioned with such skill, deftness, and ingenuity that such talent would be envied by many a novelist "in the flesh." In an anthology of the "best" poetry for the year 1917, Patience Worth had five poems selected, as against three of Amy Lowell's (1874–1925), three of Vachel Lind-say's (1879–1931), and one by Edgar Lee Masters (1869–1950)—all highly respected American poets, critics, and novelists. Was Patience Worth a spirit or a secondary personality of Curran's? Whoever she was, the large body of literary works that bears her name was transmitted through the process of automatic writing, wherein a medium produces a script without the control of the conscious self—but allegedly under the control of a spirit entity. The vast majority of those men and women who practice automatic writing on a regular basis do so because they believe that they receive spiritual and material guidance from intelligences in the spirit world or from a higher aspect of their own mind. Most of these individuals cherish this information as highly personal and seldom to be shared with others. Few practitioners of automatic writing seek to channel another "Patience Worth" and produce extensive literary works. Those who practice automatic writing seat themselves comfortably at a table, a piece of paper before them, a pen or pencil held in their hand in the manner in which they normally write. The tip of the pen or pencil rests lightly on the paper. The writer's wrist and arm are kept loose, the wrist preferably in such a position that it does not touch the table at all. No direct light is allowed to shine on the paper. If necessary, it will be shielded with a piece of cardboard or something similar. that the writers concentrate on their hand and what it is doing. If the writers do not wish to keep their eyes closed, they may even read a book while experimenting, just to keep their thoughts occupied. With practice and patience, messages begin coming through. Those individuals who are successful at automatic writing say that it usually takes three or four sittings before the first intelligent results are achieved. They advise beginners that the length of the sittings should not be prolonged unduly, even after meaningful messages have begun to appear. Technically, Pearl Curran did not do "automatic writing" as is commonly understood. She used a Ouija board to facilitate her writing, letter by letter, dictating the letters and words to others who parsed and punctuated the sentences. Curran claimed that she used the Ouija board as a "thought dispeller" and that the board and planchette were nothing but dead wood. She saw visions in her mind's eye, heard conversations in her mind and dictated what she saw and heard, often interpreted by an entity which she believed to be a spirit whose name was Patience Worth. Late in her writing career Pearl Curran was able to use the typewriter to write what Patience Worth spoke to her in her mind. 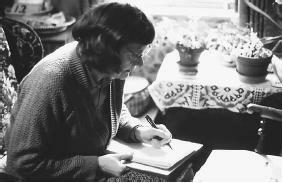 Although one may think that there was some similarity to 'automatic writing', in Curran's case her writing technique was really not "automatic" writing as usually defined as writing by a spirit or an unencumbered subconscious mind using the arm and hand of a medium while in trance or otherwise distracted.